I’m lucky enough to live next door to the most prolific organic tomato gardener in all of Colorado. My geographic good fortune and love of simple food has sparked my produce-sparing creativity. Every few days I get another supply of tomatoes. Tossing even one of these gems into the compost pile is not an option. They are that good. Here’s my way of saving the harvest and enjoying them all winter long. This is a “launching pad” recipe. Adjust according to what you have and how much you want to freeze. Once frozen, you can toss however many you need into soups and stews or thaw and blitz for pizza sauce. Place parchment paper on a large baking sheet. Preheat oven to 425 degrees. Put prepared tomatoes and garlic in a large bowl. Drizzle a small amount of olive oil over ingredients and toss gently. Arrange tomatoes in a layer on the baking sheet. Place in the oven and set the timer for about 6 to 8 minutes. Using tongs or a spatula, periodically rearrange the tomatoes so they roast evenly. It takes a total of about 30 minutes to fully roast them, but do it in increments and check often as they burn easily. Remove from oven and let cool. 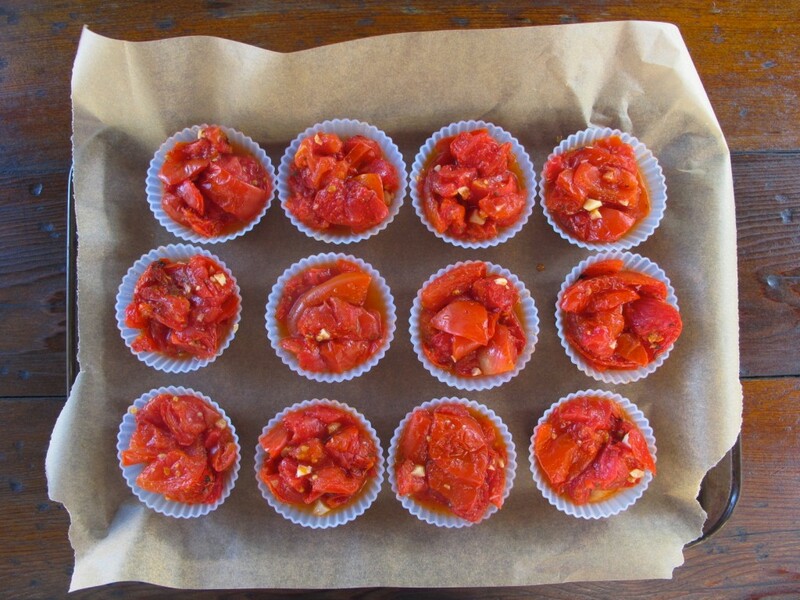 Once the tomatoes have cooled, using tongs, fill the silicone muffin cups with tomatoes. Place the filled muffin cups on a cookie sheet and put in the freezer. Once frozen, pop the frozen tomatoes out of the silicone muffin cups and place into a freezer container or plastic freezer bag. Use as needed. The photo above was taken after the tomatoes were roasted and placed in the muffin cups, but before I put the cookie sheet into my freezer. Use silicone muffin cups. Paper muffin cups don’t work. Next up, gluten-free roasted tomato and basil pizza. Stay tuned. You will not believe how good this is. Peace, love and frozen tomatoes. This entry was posted on Thursday, October 24th, 2013 at 7:31 am	and is filed under Gluten-Free Recipes, Seasonal Foods. You can follow any responses to this entry through the RSS 2.0 feed. You can leave a response, or trackback from your own site. I love the use of silicone muffin cups for this. Making our own fast food is the way to go! Thanks for adding the “fast food” comment. Good way to describe our version of fast food. Oh, these roasted tomatoes would be so good to pull out of the freezer for so many things, Melissa! I look forward to the pizza recipe! One question … do you have any concerns on using silicone? I’ve always wondered about it since it is plastic in some form. This post is really a great reminder to cook veggies and other things in small batches via the “muffin method” and then freeze them. Thanks! I totally understand your concern. Here’s my take on it –> there isn’t a lot of research out there about using silicone baking cups and toxicity. There is on the negative health implications of silicone breast implants, which I obviously don’t have. =) I don’t use these silicone muffin cups to bake with. I’m guessing heat would be much more of a concern than freezing. I cool the roasted food before placing it in the muffin cups. I also take the frozen food out of the muffin cups as soon as it’s frozen, so there’s not contact with heat and very little contact overall. I’m pretty neurotic about things (don’t own a microwave, use parchment paper against baking sheets, store food in glass containers, etc. ), but sometimes you just have to go with what you think is okay. This (the tomato recipe) doesn’t work well with paper baking cups and I’m not fond of aluminum. This is just plain easy, so until I hear differently, I’m okay with using these on occasion. Having said that, I get your concern and if you’re not comfortable using them, don’t. We got a microwave as a wedding gift many years ago (1976, YIKES!) and I would put something in it, set it, move far away from it and push the “ON” button with a long broom handle. Then I’d stay out of the room until the buzzer went off. That is called “out-to-lunch” neurosis! Rather than deal with my neurosis, I got rid of the microwave. You just have to do what your “gut” tells you is best for you. I am laughing with you about the microwave. When I met my husband back in ’96, I did not even own one. He was stunned. He thought “everyone owned one”. I never even gave buying one a thought. I do use one now, but mostly for heating the buckwheat bed buddy for my grouchy muscles. but 6 weeks ago, we moved from NY to FL and so, my tomatoes–ready and ripe–were left for the young couple who moved in. They are delicious ! but I was taught just to do them on a cookie sheet. But your way seems easier. I quizzed my hubs (a chemist) about his thoughts on silicone and he felt they were safe. I always defer to his judgement on these things. But when it comes to cooking, you can be sure, he defers to mine. I may grab some of these muffin cups! We both look forward to your pizza recipe. Thanks for always sharing so much with us GeeFreers. I did a blog post on freezing tomatoes years ago. This is how I freeze regular ones (non-roasted). Beware, this blog post is very strange. Short, but weird. I’ve tamed my blogging ways a bit, but still freeze tomatoes this way if I don’t want to roast them first. I also use herbs to roast them. YIKES, I should add that to the blog post. Loved your story of your dad, the tomato man. That’s my next-door neighbor. He’s retired, almost 80 years old, and grows the most amazing tomatoes. I love it! Funny about you and microwaves, too. =) You’ve always been a girl after my own “heart,” so to speak. I’m not surprised that we have the microwave thing in common. Thanks for asking your chemist/husband about the silicone muffin cups. Lucky lady, having a chemist in your house. Thanks so much. You’re a doll! How did I miss that (the retired English Professor part)? Where? Why did you retire? Well, I should have know as you write so well and don’t make the typical social media writing mistakes. Now that I’ve got your attention (only an English Professor/food guru would appreciate this), here’s my beet as a torrid vegetable post. =) It’s short and steamy, with a recipe attached.